We were gone all last week to visit Daughter Sarah and her Andy in Minnesota. A dear friend watched the house and Cat while we were gone. Imagine our surprise when we got home to find this in the breakfast room . 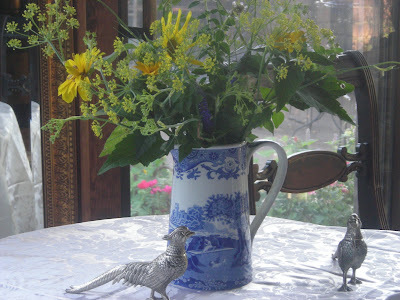 . .
A clean white tablecloth on the table, one of my blue and white jugs filled with flowers . 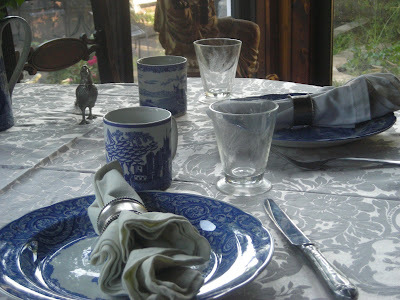 . .
And the table set for breakfast with my Spode plates and cups, my wheat juice glasses, and clean napkins in my silver napkin rings. It has to be the best tablescape ever -- it was so welcoming after a very busy and exhausting week and a long tiring drive home. 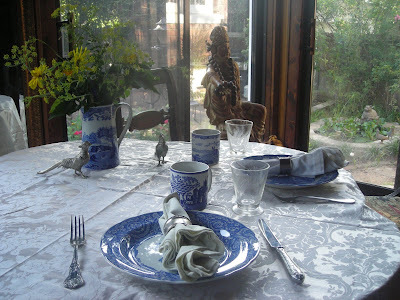 I was so pleased with the care with with my dear friend set the table -- and added flowers from my garden as well. But the best surprise of all was the plate of blueberry muffins on the kitchen counter AND the breakfast casserole and bottle of tomato juice that was in the fridge. Having emptied the refrigerator before we left, it was nice to find breakfast fixings just waiting for us. We were able to have a leisurely and good breakfast before we headed out to restock the fridge, pick up Oliver, the Corgi and gather our mound of mail. It is nice to have friends! Please join Susan at Between Naps on the Porch to see what other tablescapes there are this Thursday. Oh those blue plates are gorgeous! What a wonderful surprise from a friend. Yes, Martha, it is great to have valued friends. Beautiful tablesetting also. this is so relaxing to look at, soothing and cool like a summer breeze! What a sweet friend you have to do this for you, Martha! And I love that arrangement she did... so pretty and fresh. Blue and white with yellow always makes me happy. Such a lovely homecoming greeting! Such a sweet and thoughtful neighbor. Your spode is lovely! That's an awesome friend to have! Your dishes are lovely and the table looks so pretty. I can just imagine the food must have been great. What a lovely friend and wonderful surprise! Beautiful surprise! I recently bought a cake plate that matches your pitcher/vase. Nicely done! How incredibly thoughtful! You have an amazing friend that went above and beyond her house sitting duties! What a beautiful story of friendship. Love those blue plates! Thanks for visiting my blog and leaving me a comment I appreciate it! What a sweetheart your friend must be! That was such a nice thing to do. 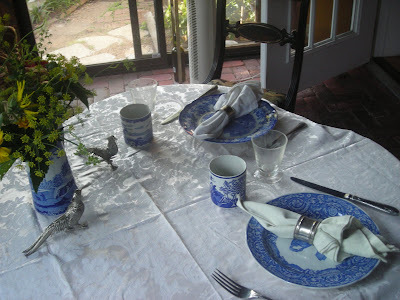 The yellow flowers were just perfect with your blue and white china. What an amazing gift. That sure makes coming home less stressful. What a wonderful friend you have. She certainly knew how to welcome you back home and make you feel loved. I love your beautiful dishes.....such a pretty, pretty table. What a nice surprise and beautiful tablescape! Looks like a lovely breakfast room! What a kind and thoughtful neighbour you have. i love it all but especially the pretty jug with flowers. What a wonderful friend. I am looking after a neighbor's cat right now. They will be back next week. This is such a great idea, I think I will use it to welcome them home. Thanks for sharing. YOU must be a wonderful neighbor--in order to have a friend who wants to do such a lovely thing for you! Thank you for the thoughtful comment you left for me. Hope the rest of your day goes well. 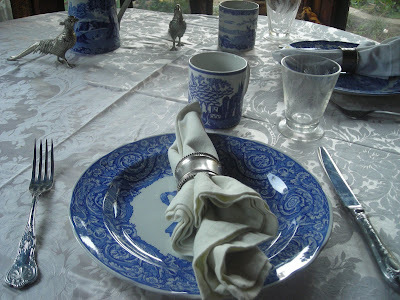 Beautiful blue and white tablescape! I have blue and white in my spare room and in the main bath, which is just across the hall. You are fortunate to have such a good friend - you must be very special to her! Well isn't that just the nicest thing to do! And the nicest thing to come home to find! I adore blue and white, so this sets my heart aflutter. Charmed by it all! Nice neighbor! Such a good idea, I may copy her! Pretty dishes! What a great friend and pretty tablescape. Friends like yours are priceless.! Now that's th kind of neighbor to have! How sweet is that. Wow, that friend is definitely a keeper. I love your Spode dishes. I've decided to add Spode to my collection. The problem is I can't decide which color. Such a dilema. Thanks for sharing! You have a wonderful friend and I'm sure your friend feels the same about you. The table is lovely and the food sounds delicious. The photo of your home is very pretty on the header.